With the introduction of IBM Notes 9, one of the major design goals was to implement the IBM "One UI" experience with an updated interface to the Notes client. Within the FRAMEWORK utilised by the OneUI design principals, major navigation elements are located across the top of the 'page'. Feedback supplied to IBM designers also indicated that many users 'lost' the quick links to their Personal Information Management (PIM) applications (Mail, Calendar, Contacts, To-Dos, etc) with the introduction of the "Open" button with the release of Notes 8.*. I have also had feedback from many users when Notes 8. * was introduced, saying they missed the "Bookmark Bar" and it's single-click access to Bookmarks. Getting the "Bookmark Bar" back in Notes 8/9 is quite simple, just right-click the "Open" button and choose "Dock the open list"
You may notice two glaring omissions from the Masthead, To-Do's and your Notebook, never fear, in a coming post I'll show you how to add them back! In addition to the new short-cut icons on the masthead, IBM have also introduced some new keyboard short-cuts to access common PIM features too! Choose the Buttons you want to appear on the Masthead (Figure:2). The new Masthead is available in the IBM Notes 9 client as part of the "IBM Social Theme". 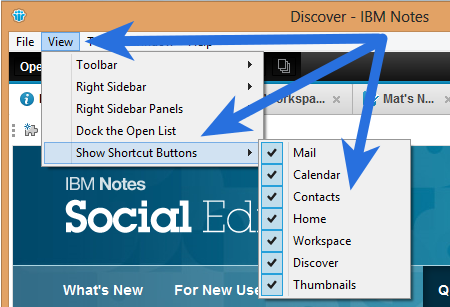 If you install Notes 9 and choose not to use the "IBM Social Theme" the short-cut buttons will still appear, but will be located on the "Window Tab" bar along with the Open button and application "Tabs". Without the "IBM Social Theme" selected, the Search toolbar will also revert to being just another "Toolbar" across the top of the Notes client window. Interestingly, if you turn the "Search" toolbar off in this configuration, and then switch back to the "IBM Social Theme", the search bar will appear back on the Masthead again. One of the fantastic features of the Masthead is that it can be customised to suit your own environment, that is: a developer within your organisation can add links and buttons to your own frequently used applications to the Masthead. I'll be showing you how to do this in an upcoming post. The new IBM Notes 9 Masthead, a great new addition to the Notes 9 client interface. I don't really see the added value of redundant bookmark icons that consume valuable vertical space instead of just using the same icons on the left. Instead IBM should've made it easier for admins to add and manage the old bookmarks. Or provide something like the pinned tabs of modern browsers. Can this be enabled by desktop policy? @1, Oliver: The OneUI design provides a consistent User Interface across *all* IBM software applications, the new Masthead fits within that framework by providing navigation between the 'Major' features within the Notes client. As mentioned in this post, IBM have included most of the frequently used options within the Notes client - there's even a "Workspace" option - and these can be extended within your own organisation to include your own links. I agree that providing an easy way to manage the old Bookmarks via policy would also have been a great option. With regard 'pinning' Tabs, this can be achieved in Notes via preferences using: "File -> Preferences -> Windows and Themes -> On restart, reopen any tabs that were open when I closed the client". Alternatively, if users Right-Click the tab they want opened at Start-Up, choose "Bookmark" and then bookmark the tab under "More Bookmarks -> Startup" the tabs will be "pinned" and will appear on the Window Tabs every time the client is started. @2, Ravi: Do you mean enabling the "IBM Social Theme" or choosing which icons which appear in the Masthead? Is there a way to add more links to the masthead besides those shown? I would love to have my ToDo list and my Notebook available in the same way as mail, calendar, etc. yes, the masthead consumes valuable vertical space! How do I turn it off? I hate it when vendors supply something like a unified toolbar but dont let you turn it off! Do I have to hire a developer to turn it off? It's fair enough that people may have actually liked the new Masthead but I for one did not. So it would also be fair if IBM provides the users with the option to turn the Masthead on or off. Maybe there is a way but I did not find one yet. For now all I could do was disable all buttons but the bar just remains there. Even the search box can't be removed. How do we customize masthead? We would like to turn on/off certain items firmwide. I would like to remove the masthead, how to disable search so it disappears? If you do more development of masthead, a print shortcut would be welcome. right now it just consumes to much space. "The OneUI design provides a consistent User Interface across *all* IBM software applications, the new Masthead fits within that framework by providing navigation between the 'Major' features within the Notes client." So don't give a sh... about users annoyed with unmovable search box that takes vertical space and software inability to be configured. 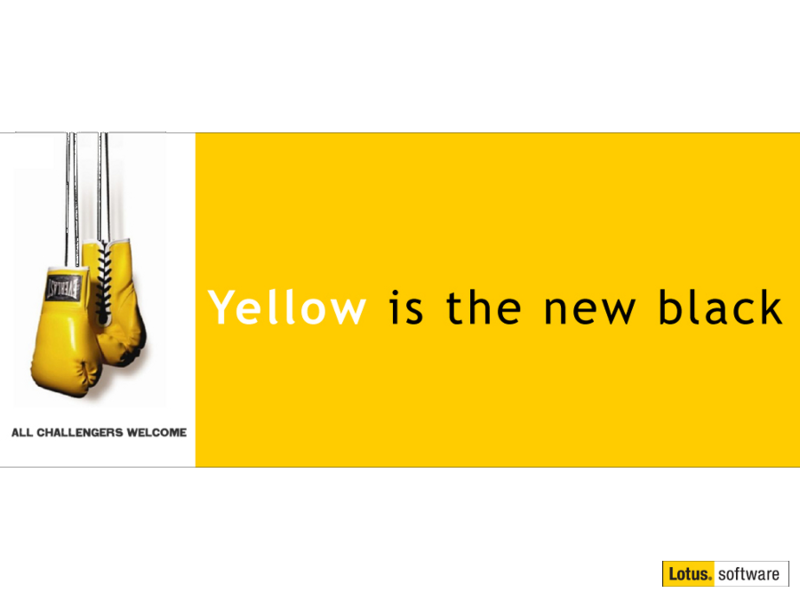 "We know better" approach! I have now switched to using the basic option. I can now view nearly twice as many emails in my inbox. Means I need to run a non-integrated sametime, but is still much better. Not being able to turn the masthead off is ridiculous. "You may notice two glaring omissions from the Masthead, To-Do's and your Notebook, never fear, in a coming post I'll show you how to add them back!" John, I suspect it's because even Mat has realised what a waste of time the Masthead is. At present you can't change the Masthead from Notes. It is possible to edit the "com.ibm.rcp.ui.prefs" file in the "workspace\.metadata\.plugins\org.eclipse.core.runtime\.settings" folder in your data directory. Our organisation uses another mail platform - so we don't want these shortcut links to mail and calendar visible. Can these be removed via policy (can't see an option) or notes client ini settings? Could you help me we have IBM Notes 9 . Since the masthead in IBM Notes 9 is a new feature in the "IBM Social Theme" I figured out -- correctly -- that you can disable the masthead in IBM Notes 9 by changing to a different theme ( "Notes 8 Theme" or "Operating System Theme [for Low Vision]" ) rather than the default of "IBM Social Theme" -- only the "Social" theme includes the masthead (which I also hate, to me it is a waste of vertical space compared to the more classic GUI layout). do you find a way to remove masthead? Hey Mat, how do you undo the masthead thing? I have one machine with it, one without. Difference was installing social edition or not. There must be an easy way to kill the black bar and search attached to it.